IN 1922 the RUC shot dead three nationalists in the North Antrim town of Cushendall. Many locals believe the killings were carried out in retaliation for the IRA execution of British cabinet Minister Sir Henry Wilson and have tried to uncover the facts of the case for years. 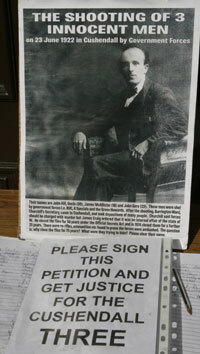 One of those who campaigned for the truth was Donegal man James McAlister. Sadly James passed away earlier this month, before his quest was finished. Another of those involved in the campaign to find out why the RUC murdered three unarmed nationalists is Belfast man CHARLIE HILL, here he talks to ÁINE CARSON about his friend James and their struggle for justice for the Cushendall Three. Charlie says: “I met James 10 years ago. We were both researching the deaths of our family members and became the best of friends. “My uncle John Hill, James’ uncle Seamus McAllister and another man called John Gore were shot dead by the RUC in the County Antrim town of Cushendall in 1922. The night before they were shot, Sir Henry Wilson was shot dead outside his London home. Seamus McAllister (18), an unarmed Óglaigh na hÉireann member was accosted by the RUC in Glenariff, County Antrim asking if he was the one that shot Henry Wilson. “He was arrested and put in the back of a tender. That same night in Cushendall, John Gore (22) was chosen at random by the same RUC men. He hid behind the counter of Annie McGonnells butchers shop to escape them. “All three men were found dead in the alleyway behind Annie McGonnell’s shop. British barrister and former Times editor, Robert Barrington-Ward was sent over to Ireland to investigate the deaths. Witness Annie McGonnell sadly ended up in and out of mental institutions for the rest of her life. Because of her mental state, her evidence was unreliable. The Justice of the Peace gave evidence that he heard Seamus McAllister being trailed down Shore Road in Cushendall crying ‘please don’t shoot me’. In a letter to James Craig, the first Prime Minister of the new Northern state, Barrington-Ward said those responsible for the men’s deaths should be charged with murder. Continuing the story, Charlie Hill said: “Using the Official Secrets Act, Craig put 75 years on the papers, meaning they couldn’t be released until 1997. So we went in 1997 to get the papers and another 50 years was slapped on them by the government. “In the end we got a secret document from the Public Records office and found that the statement given to the judge in 1922 wasn’t signed or dated or anything. “It said that the RUC were fired at from five yards by up to 20 IRA men using revolvers. Yet no RUC men or A-Specials died that day. “The only bullet marks in Cushendall are the ones in the alley where our family members died. “James told me his father used to go up to Cushendall every year and say a rosary at the spot where his brother and the other innocent men were found murdered. The families of the Cushendall three set up a group to clear the names of their relatives. In the Belfast area, they have a petition that can be signed in the Roddy McCorley Club on the Glen Road, and Sarsfields GAC. Charlie adds: “for the Stormont assembly in Belfast to take notice of the petition, there needs to be over 1000 hand written signatures.